A Twitter Chat is a live Twitter event, usually moderated and focused around a specific topic. To filter tweets into a single conversation, a hashtag is used. A set time is also established so that the moderator, guest or host is available to engage in the conversation. Many educators suggest that Twitter Chats have been more valuable to them than any other type of professional learning. The information gained from these chats can make a profound difference in improving your professional practice and can inspire you in ways that you never thought were possible. These chats also provide you with a unique opportunity to connect with educators around the world. Please view this official list of education-related Twitter Chats and choose one of them to participate in to earn your badge. 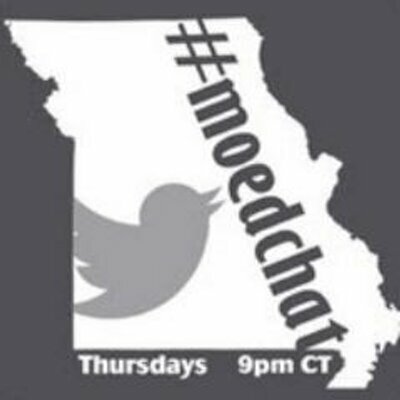 Don’t forget about MOedchat On Thursday nights at 9:00pm. Leverage the power of Twitter as a platform for professional learning by participating in a conversation on 21st learning and engaging educators globally. Upload a screenshot showing evidence of your participation in a Twitter Chat – make sure your screenshot captures one of your tweets!